L-cysteine is a semi-essential amino acid, meaning that the human body is capable of producing it in trace amounts. The primary purpose of this substance is to serve as a building block of the potent antioxidant glutathione, which is also known as “the mother of all antioxidants.” Beyond that, L-cysteine plays important roles in the building and repair of tissues, the support of the digestive and respiratory system, and many others. L-cysteine can be taken as a supplement known as N-acetyl-L-cysteine (NAC). In spite of its importance to the human body, potential health hazards can arise from taking in too much of this substance. The recommended dose of L-cysteine is seven grams a day at the most. Going beyond this will result in L-cysteine toxicity, wherein the cells sustain oxidative damage. Taking in too much L-cysteine has even been found to cause death, though this is limited only to extremely high doses. Taking NAC supplements orally has numerous gastrointestinal side effects. According to LiveStrong.com, these can range from vomiting to diarrhea to dyspepsia, which by itself can include bloating, stomach discomfort and belching. Moreover, the active ingredient found in NAC supplements have been known to cause nasal discharge and inflammation in the mouth’s mucus lining. In some cases, dizziness, weakness, and headaches have been recorded after taking oral doses. Intravenous administration of L-cysteine and NAC have been linked to severe allergic reactions, most notably the swelling of the soft tissues in the lips, face, and around the eyes. Anaphylaxis, a life-threatening allergic reaction, has been known to result from this as well. Inhaling NAC supplements can trigger chest tightness, mouth numbness, drowsiness, and may even worsen the symptoms of asthma. Individuals with heart conditions should consult a medical professional before taking NAC due to its effect on homocysteine levels. NAC supplements have been observed raising the body’s levels of homocysteine, which are amino acids that can damage arterial lining and increase the risk of blood clots when present in high amounts. Those with cystinuria are advised against NAC supplements as well. 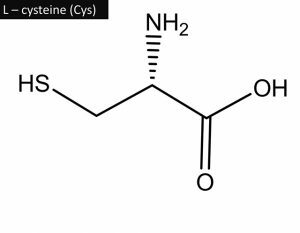 Cystinuria is a lifelong genetic condition that leads to cystine — a disulfide that contains two cysteine molecules — accumulating and forming stones in the kidneys, bladders, and uterers. People on certain medications are cautioned against taking NAC supplements, specifically, those who are on medications for high blood pressure, antifungal actions, and immune system suppressants. The ingestion of L-cysteine and NAC supplements has not been proven beneficial to pregnant or breastfeeding women, so these can be avoided in their entirety, or taken under strict medical supervision. Too much L-cysteine can harm the body overall. Depending on how it’s taken, L-cysteine may place unnecessary strain on the digestive system, nervous system, or skin. Accidentally inhaling L-cysteine may damage the respiratory system too. MSG: Where you least expect it. L-cysteine is an amino acid that the body can produce on its own, but only in small amounts. Supplements of L-cysteine are readily available, but these are known to have a multitude of detrimental health effects. Overdosing on L-cysteine can damage the cells and lead to death, taking them orally can upset the digestive and nervous systems. and lead to headaches, dizziness, and stomach upset. L-cysteine that has been administered intravenously can cause allergic reactions, while inhaling it can harm the respiratory system. Those who should avoid L-cysteine supplements include people on medication for high blood pressure, and individuals with heart conditions and cystinuria.